Imagine waking up in your hotel room and feeling as though you're floating amid the clouds? Just when you thought the record-breaking city of Dubai had peaked with the creation of the Burj Khalifa, the UAE metropolis wows once again with its brand new Gevora Hotel - the tallest hotel in the world. The 75-storey building has officially surpassed its rival, J.W. Marriott Marquis, and stands at a height of 1,168 ft. This quarter-mile tall structure is located on Sheikh Zayed Road and boasts 528 beautifully furnished rooms across 75 floors - a welcome addition to the city's already spectacular skyline. Want to see if for yourself? Discover our top 15 things to do in Dubai for the best of shopping, sightseeing, sand and safari's. Who says luxury should cost a fortune? For a hotel which at first glance may appear a little hoity-toity, the room charges here are quite competitive. On average, the room charges will go for somewhere between $163 and $190 (£114 and £136), as compared to an average of $243 (£173) in the city's nearby hotels. Gevora has 528 rooms, including a variety of 232 Deluxe Rooms, 265 One-Bedroom Deluxe and 31 Two-Bedroom Suites. From a culinary standpoint, what makes this hotel special is that no alcohol is served within its premises. This decision to go dry was consciously taken by the authorities to ensure a safe and congenial environment for children and extended families. Instead of a bar, this fantastic 4-star property offers an all-day international buffet restaurant named Gevora Kitchen, a Middle-Eastern restaurant known as Level Twelve, plus a chic rooftop café where guests can enjoy shisha and a selection of traditional Arabic dishes. 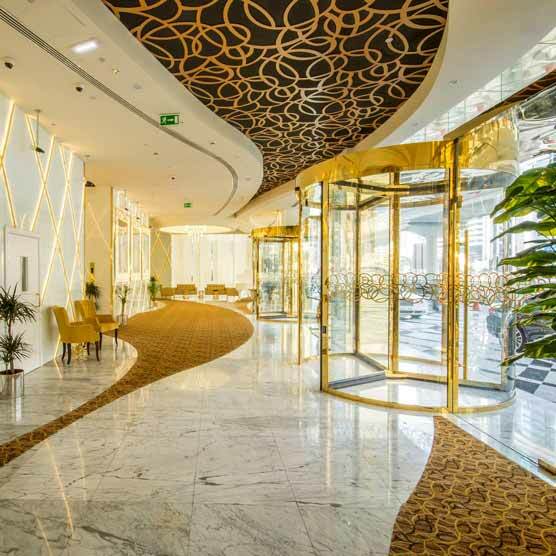 From the revolving front-door plated with solid gold to the 12th floor rooftop pool with sweeping views of downtown Dubai, the tallest hotel in the world is steeped in luxury. The spa on the 71st floor serves a selection of pampering beauty treatments, while the health club includes a sauna and steam rooms. Located on the doorstep of the Dubai Marina, Gevora Hotel is a short drive from a host of attractions such as The Palm, Dubai Mall and the World Trade Centre, providing guests the chance to shop, sightsee and dine in ultimate style. While we don't offer hotel stays at this superb new establishment (yet...?!) we do serve up a variety of fantastic Dubai holidays, with an abundance of hotel and board options to make your trip to this far-flung jewel as fabulous, and affordable, as can be.